Henry Parham was working as a porter at a bus station in Richmond, Virginia, when the draft letter came in the mail. “They got me,” he said. His reluctance to serve wasn’t rooted in the difficulties of a Jim Crow army or a lack of patriotism. His reasons were more practical. The Great African-American Migration was underway when Parham left a sleepy corner rural of Virginia where many of his extended family and neighbors worked as sharecroppers. He was happy to land a steady job at the bus station, where he was earning a sum that provided, for the first time in his 21 years, a dose of security. When Uncle Sam came calling, Parham was wasn’t keen to leave behind the comfortable world that he had built. Yet he boarded a train bound for Tennessee, and trained to fly strange balloons for an indeterminate mission. That mission would take him across the sea to a five-mile-long patch of sand called Omaha Beach. There, Parham would be tested as never before. On May 7, 2013, the French Embassy in Washington, DC, awarded him the Legion of Honor for his service on that very long day. Henry Parham greets fellow veterans at Allegheny Cemetery in Pittsburgh on Memorial Day, 2011. 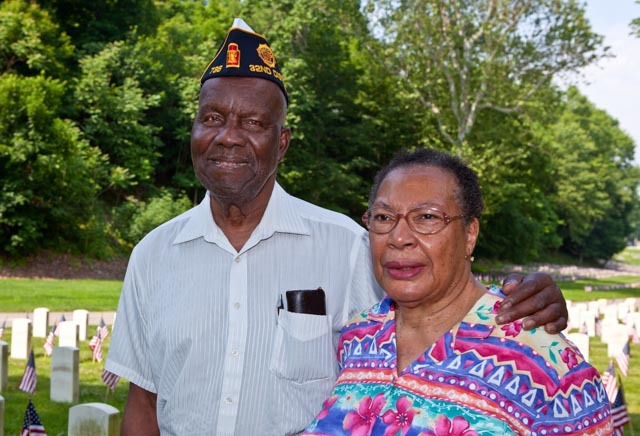 Henry Parham met his wife, Ethel, at Ethel’s Diner in Pittsburgh where she was a waitress. They married in October 1973.